The short film industry is a hive of opportunity for a wide range of fashion and costume designers. With its malleable, experimental genres, and emerging forms of fashion and advertising, short film is the perfect medium to explore the potentials of future clothing design. We speak to costumier and ASFF 2014 attendee Wendy Benstead about her ongoing creative practice and thoughts on the changing perceptions of design in the film industry. Designer for Paloma Faith, Kimberly Wyatt, BBC, ITV and a range of commercial productions, Benstead is an expert in her field and the ideal candidate for advising aspiring costumiers. ASFF: Did you enjoy your ASFF experience, and were you inspired to make new work? WB: I enjoyed the event very much – it was an excellent opportunity to network, and to meet passionate people within the film making field. I also had the chance to view some inspiring film works, and discuss all aspects of film making with like minded people. I feel inspired to work with some of the producers and directors I met, and also was propelled into some design thought processes in regards the visuals I saw in some of the short films. ASFF: Which designers motivate your practice? WB: In general, I mostly draw inspiration from imagery and clothing construction outside of the film industry, as I like to work directly from external influences to avoid copying. However, costume designers that inspire me include Eiko Ishioka, Sandy Powell, Coleen Atwood and Michael Wilkinson. 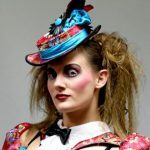 I also adore the design works of fashion designers such as Vivian Westwood, McQueen and Galliano, and often look to the fashion world for inspiration.